The Knorr Ikan Bilis Seasoning is made with Grade A Ikan Bilis and no added preservatives for fresh goodness and aroma. The new packaging it comes with not only makes it more convenient to store but is also part of our commitment to reduce global waste. Salt, Maltodextrin, Monosodium Glutamate, Anchovies, Sugar, Hydrolysed Vegetable Protein, Onion, Palm Fat, White Pepper, Sodium Inosinate and Guanylate, Spices. All food additives are of plant origins. May contain traces of cereals containing gluten, fish, crustasean, soy, egg, milk, mollusc, peanut and tree nuts. 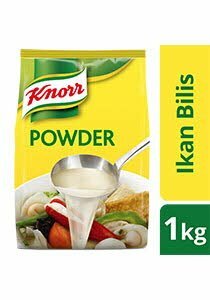 For Basic Stock: Dissolve 24g (2 heaped tablespoons) of Knorr Ikan Bilis Seasoning Powder in 1L of boiling water. Store in a cool and dry place. Oce opened, fold the bag and seal properly to keep the remaining content fresh.